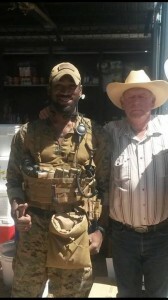 CNN interviewed Cliven Bundy’s bodyguard, a black former marine who goes by ‘Charlie Delta’ after he posted on his Facebook timeline exposing the leftist media hoax intended to paint Cliven Bundy as a racist. Charlie pointed out that the mainstream media constantly uses race to divide it’s audience with distortion. In this case, liberal pundits attacked Bundy for saying, basically, that race-based social welfare generally makes things worse for blacks and other minorities, not better, to the point that in some ways African-Americans may have had an easier time under slavery than under the current system of nanny-state coddling. That kind of thinking is not racist; as Charlie points out, it is equally true for any minorities, but the idea totally undercuts the socialist agenda most big media likes to shove down the public’s throats. Watch his brief interview and read the full text of Charlie’s letter below. “The media distorts information to the point of social division. This is a photo of myself and the resilient, often charismatic, and maybe not so tactful Cliven Bundy. He’s a cowboy and a helluva family man, not an orator. One thing he definitely isn’t – a racist. I found his comments to not only be NOT racist, but his own view of his experiences. Who the heck are we to determine another man’s perspective on the world around him?! Just because Picasso’s view of the world was abstract, does it negate the fact that his art was genuine? Furthermore, if you take the time to do your own research, you’ll find that his statements about some black Americans actually hold weight. He posed a hypothetical question. He said, “I wonder IF” … Hell, I’m black and I often wonder about the same about the decline of the black family. Bottom line is that we are all slaves in this waning republic, no matter our skin color. Mr. Bundy could have used any racial demographic as an example: Native Americans on reservations, whites in trailer parks, etc. He noticed the crippling effects of receiving government “assistance” and the long term result of accepting handouts. It’s not progress at all. I challenge Sean Hannity, Rand Paul, and others to read my comment and reconsider their position in this matter. Individual liberties are at stake here, yours and mine. THAT is the issue. Don’t let the liberal media and ignoramuses like Glenn Beck and that weasel Harry Reid make you lose sight of the real issue here: The federal government is a burgeoning behemoth and a bully on a once constitutional playground. Barry, Barry. You are a slave to liberalism if you believe that horse $#%&[email protected]*. It just goes to show you what is wrong with our country weak minded people like yourself. Who would not no the truth of anything unless it was spoon Fed to you personally by the liberally biased press. I feel sorry for you, Barry. You say he is a slave to liberalism, but you have no facts to back up your argument. Very typical of a Conservative to name call because they have nothing else. I can’t believe retArdicans are trying to take away our rights and land! Bundy is not racist! He just knows what’s good for the negros! Just imagine the America CNN wants for us. What we have now is due to them. America is not the America it once was thanks to the leftist media..